I like easy-going plants. That includes my no-name daylilies going gangbusters right now. All I do is cut back browned foliage once or twice a year, remove spent bloom stalks, and stand back and gawk. Native flame acanthus (Anisacanthus quadrifidus var. wrightii) is another performer for lazy or busy gardeners. It’s also called hummingbird bush—along with many other plants—because hummingbirds do indeed promise unforgettable wondrous hovers. Butterflies go for it, too, though “usually” deer will not. Adapting to just about any soil, including my clay, it wants full to part sun. It freezes back for most of us. Simply clip to the ground in late winter and lightly shear into early summer if you like. In summer through fall, flaming tubes of nectar sound the “come and get it” gong. Find out more about flame acanthus. So, what’s this knobby growth spied by Emily Joyce Bolf and Jeremy Bolf on their red oak? They can tell you that it’s a gall created by an oak apple wasp to protect its larvae. Last fall, I found woolly oak galls on my live oak. You can find galls of many types on your trees. Most aren’t harmful at all, so enjoy the artistic nursery building! Get Daphne’s complete answer and how Emily and Jeremy sleuthed the answer on their own. We want to be kind to the earth, but we need to be kind to ourselves, too! I can tell you right now that I sorely regret (literally) not wearing heavy-duty shoes on my earlier shovel escapades. We need thick gloves when hauling big rocks, long ones for prickly things, and ones to grub around and get wet. Save the sandals for that long cool one when your construction day is over! Get Neil Schmidt’s tips to spare future visits to physical therapy or the dermatologist. Celebrate Earth Day all year long with sustainable ideas that grow resources along with beauty. 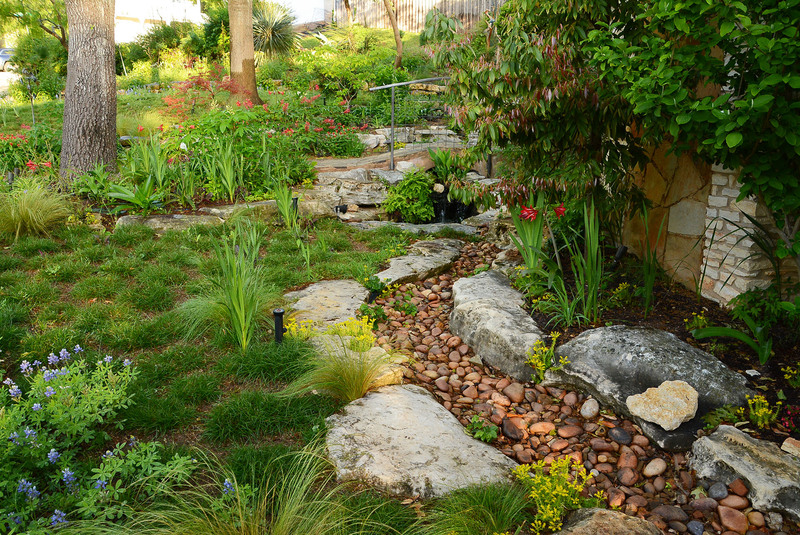 Wendy Buck from the Travis County Master Gardeners previews the May 6 Inside Austin Gardens tour for Earth-Kind design ideas. There’s something for everyone, including habitat, vegetable gardens and bee hives, no-lawn pollinator gardens, and much more. If you’ve watched Velia Sanchez-Ruiz’s garden on CTG, here’s your chance to meet this absolutely joyful gardener and wander her front yard wonderland of flowers and beneficial herbs. Hands-on owners will be around to answer your questions. I promise, you’ll come home with lots of DIY ideas! Watch now! We headed to Spicewood for a closer look at Shari and John Bauer’s garden above Lake Travis, also on tour May 6. In their wildlife habitat garden of whimsy, spirituality and renewal, Shari and John hit creativity mode when they chance upon a piano left for trash, a rowboat buried in mud, or abandoned heirloom kettles. They resurrect orphaned objects through enchanting vintage vignettes. “We also use a lot of poetry in our garden, and prose and sayings and quotes because they’re so inspiring,” Shari tells us. Shari and John rescue dogs in need, too. I just love the way they honor those who crossed the bridge. Fragrant lavender shares this hill with equally drought-tough agaves. When they left Houston, Shari packed her gardening skills, honed as a Harris County Master Gardener. Now a Travis County Master Gardener, she orchestrates congenial wildlife habitat that’s renewed abundant visitors that they both treasure. On every level, they tuck in charming lounges to sit and dream and bring people together. Shari’s romantic greenhouse double duties as workspace and intimate “she shed” to host friends. Family is very much a part of this garden, from the crosses that Shari’s dad made to John’s family pass-alongs and son Colton’s intricate sculpture from old car parts. There is SO much more that you don’t want to miss!